NOT hearing a baby's cry at childbirth is a heartbreaking silence - stillbirth is a terrible fact of life and is still being treated as taboo. One Mackay couple wants to talk about stillbirth, to let others know Sands Queensland is available to help them through the grieving process. Aaron Taylor and Sarah Riseham lost their daughter Scarlett Rose to an umbilical cord accident nearly a year ago. They have Scarlett's memory tattooed on them. "Aaron's tattoo has the three roses which represent the three days we were able to spend in hospital with Scarlett, the pocket watch shows the time that Scarlett was born on May 23," Ms Riseham said. Ms Riseham's tattoo has the rose with the locket and heart shaped key which represents Scarlett will always be forever in her heart. The couple have a three-year-old son, Dominic, who helps to keep his sister's memory alive. "We visit Scarlett and we have a group of stars so he knows she's up in the sky," Mr Taylor said. Mr Taylor said his partner was very open and could speak of what happened easily but he still finds it difficult to gather the emotional strength to speak openly about everything. "For me it is a lot easier to talk about her as I have found peace and also I come to realise that unfortunately as much as I blamed myself at the start I know now that no matter what I would have done nothing would have changed what had happened and it was just a freak accident," Ms Riseham said. "Aaron on the other hand, it still hurts him to talk about her and hits him quite hard when someone brings her up. We both miss her more and more each day even worse knowing it's coming up to a year since we lost her but we both know she is in the sky watching down on us and smiles with us laughs with us and is keeping us safe." After talking to the Midweek newspaper openly about their stillbirth experience, the couple has received amazing community support for an upcoming fundraising event for Sands Queensland. "It's making us feel a bit more clarity on what happened and helps put us at peace knowing we are doing everything we can to honour our daughter's legacy," Mr Taylor said. "We feel that it will help others understand that there is a lot of support for these circumstances." Ms Riseham said the feedback they received had been great and encouraging with a number of possible venues with one pending council approval. "We have had so many people voice their interest into our upcoming event, they have been warm and welcoming to our ideas," Mr Taylor said. Once the venue is approved the couple hope to host the "Cruise for Angels" day in August. "We are still looking for major sponsor to help cover costs of liability insurance as without it the event simply cannot happen," Mr Taylor said. "(We need) More interest for food stalls and vans, jumping castles, amenities, music/entertainment, advertisement for the event, a logo designed and security for the day." For information about support of stillbirth or infant/pregnancy loss visit the website www.sandsqld.com. 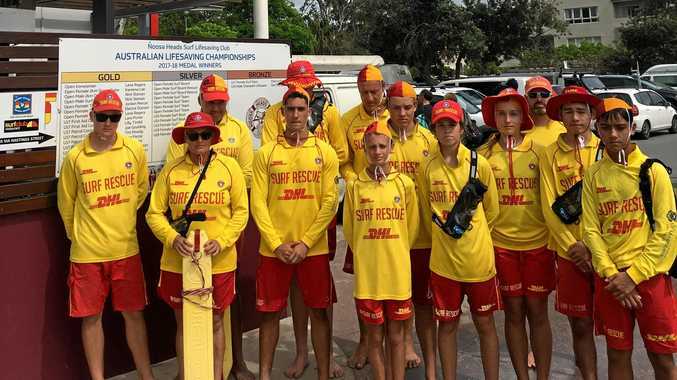 News A busy Easter long weekend saw several rescues at Noosa as news of a tragedy in Victoria hit close to home for the surf lifesaving community.